Horse Agility and Calming Signals. It’s that time again. I fill a cart the dollar store and a glimpse in the rear view mirror while driving away looks like a clown exploded in the extended cab of my truck. Then the wading pool comes out of the rafters and I dust off the bubble makers. Cones, barrels, and hula-hoops make their way to the pasture, and I hang my favorite sign: Snakes in the Llama Room. Horse Agility is back! Or I could call it a Calming Signal Event and really elevate the conversation. Horses would come running. Horse agility is a game of partnership without coercion. 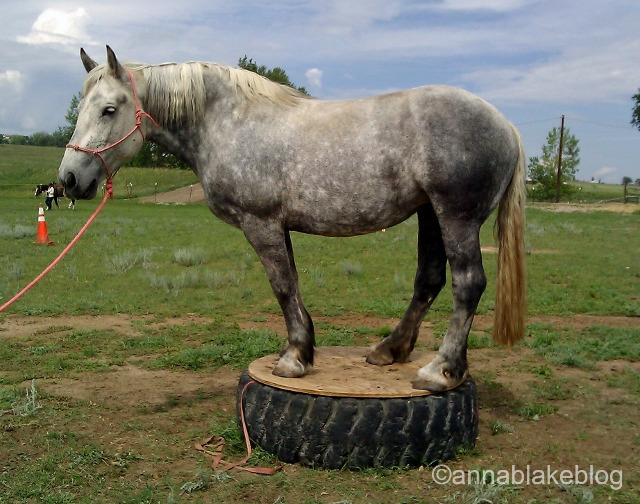 Most of us have done obstacles in-hand with our horses, but Horse Agility is different. The eventual goal is to work off lead, just like dogs do. So we begin using a long, loose lead rope and just like dog agility, we do the asking and the animal does the obstacle. Instead of leading the horse over the obstacle, we send the horse while we stand at a distance. For crying out loud, you say, I am just holding the rope! If you think you are not pushing, and he acts as if you are, who wins? You want to get this right; if the first step of working initiates a fight, you will never get his best work. At this moment you are setting a tone for the day. Go slow and give him a chance to volunteer. He might be slightly braced waiting for you to pull on the rope. Just don’t do it. Take a breath or two, and he will look back. Then reward him while you feel the entire universe shift towards partnership. It’s a quiet internal feeling that might take a minute to recognize, on both sides. Walk on, out of his space, and cue with your inhale and your feet. Halt with an exhale and stop your feet. Reward lavishly, let him know you like his listening. The lead rope may only be used as a last resort, then just a slack jiggle or a quick ask and release. You might have a feeling being impaired or disabled without the rope, that’s your cue that you over-cue by habit. If your horse looks a bit confused at this point, it’s because he is a bit surprised by your peaceful cues and he might need a moment to thank the horse gods. This is the perfect time to reward him, go slow and stick with him. Reward any slight movement in the right direction. Instead of punishing him for looking away or going slow or seeming distracted, hear him. Acknowledge his calming cues and find a smaller, quieter way to ask. Then feel the universe shift one more time. It feels small at the beginning, almost like you are imagining it. Start with an easy obstacle and listen to your horse. Walk up to a simple tarp or a hula hoop on the ground. Now, resist the temptation to manipulate him with the lead, instead you will stand out of his space and send him over it by asking his hind to step forward. Remember the foundation of dressage is rhythmic movement; the art in agility is that same relaxed mind and body. He calmly crosses and you reward his quiet success. Next time, halt him half way over without pulling the rope. Your horse especially likes the no pulling clause here. Exhale him to a stop, let your body language rest. That release is the reward. Walk away and take a break. Next go, how about backing him over, again with a long rope with quiet cues. Can you ask his left hind hoof to stand on the tarp, step by step, by sending and breathing? Here’s the secret: Approach every obstacle the exact same way, whether it’s a wading pool with invisible ankle-biting trout or seemingly 2″ wide teeter. Never let the obstacle be bigger than the conversation with your horse. Then ride that way too. I know, I know: the simple things are never easy. Obstacles are not pass/fail tests. In fact, the obstacle isn’t the point at all. Sometimes people drag horses through the course like it’s a race and the horses have the glazed look, resisting the rush. Are you pulling on his face? One reason it matters is that if you do it on the ground, you probably do it in the saddle too. Maybe you have dominated all obstacles in record time and you’ve finished first. I will be just as unimpressed as your horse. If you want speed and confidence, understanding has to come first and going slow is the fastest way to get it. The goal in agility is sweet partnership, in a soft relaxed and forward way, with the horse doing the work and the handler quietly asking. Sounds like dressage to me: Ground Dressage. Any horse, any size, any age can do it, but are you fit enough for Horse Agility? I mean emotionally fit, of course. The secret to agility, or anything else with a horse, is maintaining a calm energy. Can you stay present in the moment with your horse without distraction or frustration? Can you lead with positive confidence? The first obstacle is always our own attitude. Superb post! Thank you. That makes me want to do horse agility! Great timing! I just got the book you recommended, looking for something to do with my old ones. Perfect timing! I just got the book you recommend yesterday. I was looking for something to do with the mini and the 2 retired oldsters. Looking forward to having fun this summer. Great book, wonderful for the elders. It is with great interest that I read this post as I have recently begun agility with my Doberman and I’ve often thought, “Some of these principles are like riding/training a horse.” Now I can take dog principles and apply them to my next horse. I am eager to read your older post and explore this new (new to me) area of horsin’ around. And I don’t know how you got the gray to stand for a photo, but it’s amazing. That percheron mare is Misty, adopted and loved from Ruby Ranch Horse Rescue. She stood there quietly while all of us ran for our cameras, and then a while longer. When she stepped down, her front feet landed softly and she grazed awhile before bringing her back feet along. Agility is wonderful! Anna – a dear friend sent me this blog of yours and I just wanted to tell you that I particularly enjoyed it and posted it on our private classroom forum for everyone to read. I got a good belly laugh out of the horse pausing to thank the horse Gods. Thanks! No corrections to be made then!